On Wednesday President Xi Jinping presided over the first meeting of the Party’s new Central Reform Leading Group, China’s state media reported. The report said that the leading group would have six departments: economy and ecology; democracy and justice; culture; society; Party construction; and discipline and supervision. It also identified the leading group’s “duty” as implementing reforms, rather than policymaking, and Xi’s reported speech at the meeting focused on how to ensure local and provincial officials actually implement the reform policies being handed down by Beijing. The fact that the meeting was so widely publicized, and many of its members were identified in Chinese-language media reports, is somewhat unusual and suggests that the Party intends for the leading group to play a prominent role in China’s economic rebalance. It was previously announced that President Xi Jinping would head up the group, which was confirmed in the report this week. The English language report on Wednesday additionally identified three additional members of the leading group, who it said would also serve as deputy chiefs. The three deputy chiefs were: Premier Li Keqiang; Liu Yunshan, the Party’s Propaganda chief and Politburo Standing Committee (PBSC) member; and Zhang Gaoli the first ranked vice-premier and PBSC member. Chinese language reports also had a more extensive list of members who were spotted by TV cameras as participants in the new leading group. The members of the group appeared to be very diverse in terms of their backgrounds, current positions, and factional leanings. The individuals almost all come from high-level Party positions and do not include many members from governmental ministries. All four vice premiers were identified as part of the leading group, however. Liu Yandong, a vice-premier, Politburo member and the highest ranked female in the Party. Some speculated that she would be named to the Politburo Standing Committee at the 18th Party Congress, which would have made her the first woman to achieve that distinction in the CCP. She previously served as head of the United Front and is seen as a key ally to former President Hu Jintao. Ma Kai, a vice-premier and member of the Politburo, was also reported to have attended the first meeting of the leading group. Ma rose through Party ranks largely through the National Development and Reform Commission (NDRC), eventually becoming its head. The NDRC is one of the entities slated to lose influence in China’s economic rebalance. In 2008, Ma was given the title of State Councilor. Wang Yang, China’s final vice-premier and a Politburo member who is widely hailed in the West as an economic reformer. He most recently served as the Party chief of Guangdong province. Zhao Leji, a member of the Politburo and Secretariat of the Central Committee, who previously served as the Party chief in Shaanxi province. 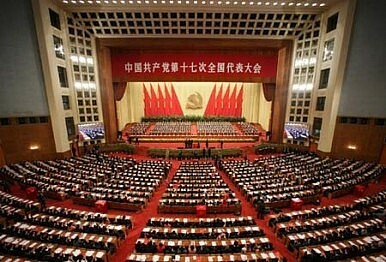 Since the 18th Party Congress Zhao has headed the Party’s Organization Department, which controls personnel decisions. Zhao’s position makes him particularly important in terms of enforcing local leaders’ compliance with reforms. Du Qinglin, an economist by training and member of the Secretariat of the Central Committee. In March 2013, Du was elected vice-chairman of the national Chinese People’s Political Consultative Conference (CPPCC). He has previously served as Secretary of the Sichuan Provincial Party Committee and head of the United Front Work Department. Wang Chen, a member of the Central Committee and deputy director of the Party’s publicity department. Zhou Qiang, China’s top judge who formerly served as the Party chief of Hunan province. Zhang Qingli, a member of the Central Committee, as well as the secretary-general and a vice chairman of the CPPCC. He was formerly the Secretary of Hebei province. Wang Zhengwei, a vice-chairman of the CPPCC and head of the State Ethnic Affairs Commission (SEAC). Wang Huning, head of the Party’s Central Policy Research Office and a close aide to President Xi Jinping. The Wall Street Journal carried a lengthy profile of Wang last year, noting that he was a key adviser and speechwriter to former Presidents Jiang Zemin and Hu Jintao before working for Xi. Liu Qibao, the new chief of the Central Propaganda Department and a close ally of former President Hu. He has also served as secretary of the Communist Youth League’s Central Committee. Li Jianguo, a Politburo member and former party secretary of Shaanxi Province. He currently serves as a vice-chairperson to the National People Congress’s Standing Committee and late last year was named chairperson of the All-China Federation of Trade Unions. There were reports early last year that Xi was planning on taking down Li for corruption. Meng Jianzhu, a Politburo member and secretary of the Central Politics and Law Commission, which saw its authority diminished when Meng wasn’t appointed to the Politburo Standing Committee (PBSC) unlike his predecessor. Meng was previously the Minister of Public Security. Guo Shengkun, a Central Committee member, state councilor and Minister of Public Security. Cao Jianming, a Central Committee member and, since 2008, procurator-general of China’s Supreme People’s Procuratorate. Zhou Xiaochuan, China’s powerful central banker.